I did this walk on Sunday 30th August 2009, doing a 15 mile circular walk that also incorporated stage two of my walk along the Royal Military Canal. 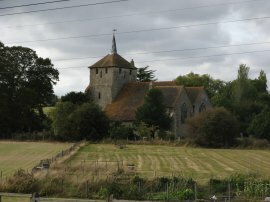 I drove down from Walthamstow and parked at a small parking space near the church of St Matthew in Warehorne. I had set off from home quite late and it was nearly 11 o'clock when I finally starting walking which is about the latest I can remember setting off for a walk. I much prefer heading off early, however I was glad I made the effort. 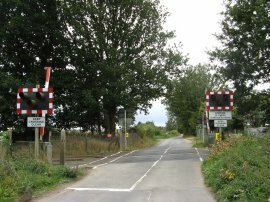 From my parking space I headed downhill along the road, where I crossed over the railway lines that run between Hastings and Rye, photo 1, and then over the Royal Military Canal. Passing Bridge Farm I joined a footpath on the left that headed over a recently harvested field, photo 2. There was no footpath sign marking the point where the footpath left the road and no markers or posts marking the route of the path over the farmland which made following the course a bit difficult when I reached the next field, photo 3, which had been ploughed over. 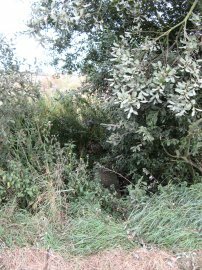 Heading diagonally across this patch of field I soon found the plank of wood, photo 4, somewhat hidden in the hedge, that took the path over a drainage ditch and into the next field. 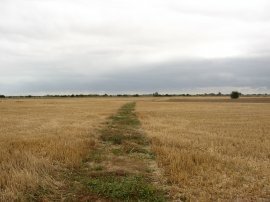 The route then followed the left hand edge of the field up to another drainage ditch at the end of the field. This was a wider and deeper ditch than the ones I had crossed so far, photo 5 doesn't really do it justice, and also lacked and bridge over it. This left me in a dilemma what to do, I had had problems with missing paths when I last walked in the area and was unsure whether to head back to the road or persevere across the fields which might ultimately lead to a dead end. Deciding to try and continue, I headed to my right along the top edge of the field I eventually came to a crossing point from where I was able to walk back along the other side of the ditch back to where the footpath is marked as crossing over, a total detour of about half a mile. A simple post marking the direction to the crossing from the start of the field would have saved a lot of time and make the path much more user friendly. 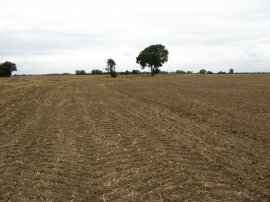 Once back on course, the next stretch of footpath was shown on the map as bearing to the left over the field to join another footpath running across the field from North to South although once again the field had been ploughed and there was no evidence of the path on the ground, photo 6. 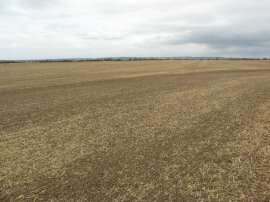 At least the soil was dry though and the earth relatively smooth to walk over. 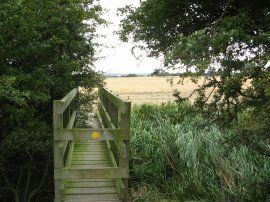 Additionally, despite the lack of a path the flat open nature of the field, and the absence of any crops, made it reasonably easy to spot the wooden footbridge over the next drainage ditch, photo 7, although judging by the way a hawthorn tree had grown across the bridge the path was not much used. 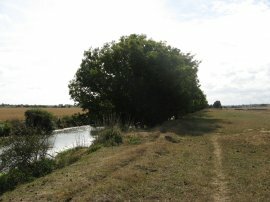 There were then four more drainage ditches to cross before I reached Ham Mill Lane, three of which had bridges and the one that didn't required only a short detour to a crossing point between the fields. One of the bridges, photo 8, was a two tier affair with the remains of an old plank bridge besides the more substantial newer bridge that had replaced it. 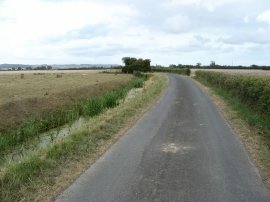 Arriving at the road I had been going to join a footpath that headed to the east past Ham Farm. This path runs parallel with the road for a while however once again there were no footpath markers from the road and the bridge over the drainage ditch that I could see from the road was completely overgrown, photo 9, so I decided to abandon this idea and instead headed to my right along the road towards a crossroads where I turned to the left. I headed along this road to a T junction where I turned to the left and almost immediately joined a footpath on the left, that for once was actually signed from the road, which heads out along the edge of a grassy field, photo 10. 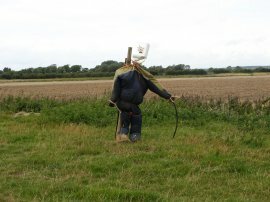 As well as passing an abandoned car the path also passed by the rather impressive, but strangely located scarecrow in photo 11. 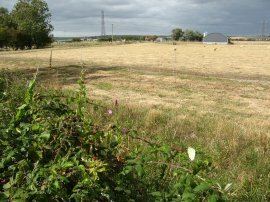 Continuing ahead, the route joins another path where I turned to my left to cross a drainage ditch, and then continued ahead over fields heading towards the left hand edge of an isolated farmhouse. 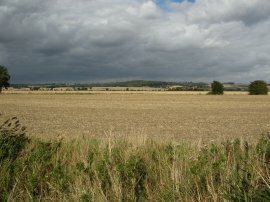 From here the route crossed the open field in photo 12 before heading along a field edge path to reach the A2070. 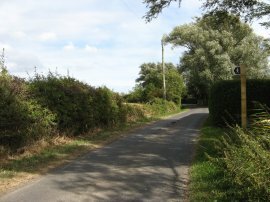 The path heads across the road and through a small patch of scrubby trees to reach a minor road in the hamlet of Snave. 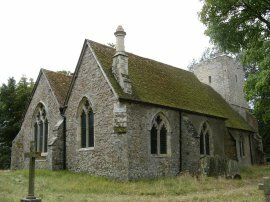 I headed across this road and down the broad grassy path opposite that leads to the church of Saint Augustine, photo 13. 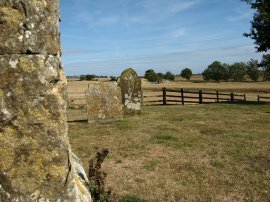 From the church I took a path that leaves the back of the churchyard, heading half right across a field towards a field edge and drainage ditch. 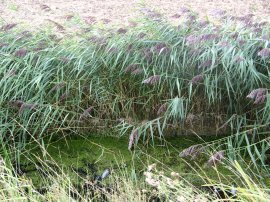 I then followed the edge of the drainage ditch to the left for some distance as it meanders between wide open fields, photo 14, before eventually bearing to my left, after the second drainage ditch on the left, to head across a ploughed field to another wooden footbridge over a ditch. This bridge had an elderflower tree growing across it and once I had forced my way through past a particularly sturdy branch I emerged into the next field with my rucksack and back covered with the juice from squashed elderberries. 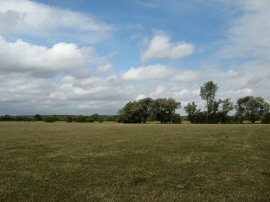 The next three fields I passed through were pasture, photo 15, two being grazed by sheep and the third by a herd of cows, which made a pleasant change from the earlier fields as I headed along the field edges up to reach Wey Street. 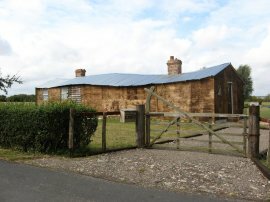 The path joins Wey Street opposite the unusual house in photo 16. 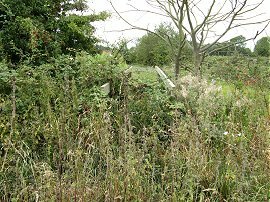 Here I turned to my right before joining a footpath on the left that ran diagonally across a couple of small field to rejoin the road at a T junction where I headed straight across and down Kitsbridge Lane, photo 17. 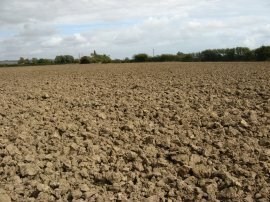 After all the walking over fields it was nice to have some firm ground underfoot and not to have to worry about navigation for a while. All the road that I walked along during this walk were very quiet, I can't remember being passed by more than three or four cars all day which made them very pleasant to walk along. I followed the road for half a mile or so until it bends sharply to the left at which point I continued ahead along a farm track that heads down to cross another drainage ditch. Once over the ditch the route of the footpath heads over a field and it took me a few moments to work out in exactly what direction the path headed as once again there were no markers or signs of the path on the ground. 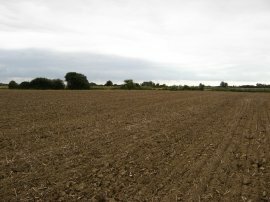 Reaching the opposite edge I needed a brief detour to the left round a corner of the hedge to find a crossing point into the next field where I was confronted by a more deeply ploughed field, photo 18. 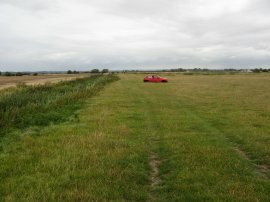 The footpath headed diagonally across this field however it was easier to cross the field at its narrowest point and then follow the field edge round to the exit in the far corner. Leaving the field I turned to the left along Wills Lane and then right along the road at the next road junction. 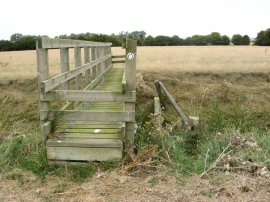 There was a footpath that linked the two roads but the gate to it from Wills Lane was padlocked shut, the path wasn't signed, and the detour along the road did not add much distance. Reaching another T junction I turned to the left and after a few minutes joined up with the route I took when I walked down to Dymchurch in stage one of this walk which I then followed in the opposite direction back up towards the Royal Military Canal by St Rumwold's church. On the way I passed my favourite section of non existent footpath, the new footpath sign to the right of photo 19 pointing straight at an impenetrable hedge, which had a barbed wire topped metal fence inside it and as mentioned in stage 1 of the walk, even if this obstacle was negotiated there is then an small ditch followed by a multi strand electric fence guarding a compound of free range chickens on the other side, photo 20. The new sign would have been far better place at one of the many unsigned locations I had passed where the path was at least walkable! I have to say the state of many of the paths in the area were a bit of a disgrace and rather user unfriendly. As it was I continued along the road to another junction where I turned to the left up the road. 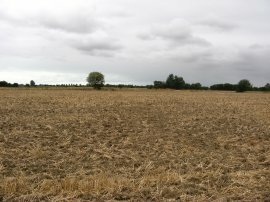 Since I had last been here a few weeks earlier the crops had been harvested, photo 21, and it would have now been possible to walk through the fields towards the canal but it was easier to stick to the road. 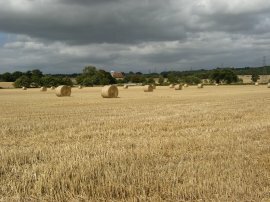 I did however follow the "footpath" over the last field, photo 22, as I headed up towards the Royal Military Canal, the large rolls of straw waiting to be collected in the field. Crossing over the canal, photo 23, I headed up to St Rumwold's Church where I sat besides the church, overlooking the canal, while I had my lunch, photo 24. As I was eating the sun made an all too brief appearance on a day of typically cloudy bank holiday weather which felt quite chilly in a strong wind. 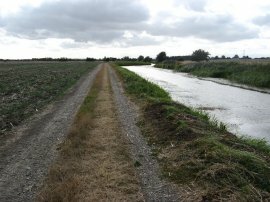 Having eaten, I headed back down to the Royal Military Canal to commence my walk back to Warehorne, photo 25. 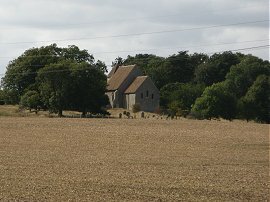 One of the feature of this stretch of the walk was the number of churches situated on the higher ground to the right of the canal and not long after St Rumwolds Church I passed below the church of St Peter and St Paul at Bilsington, photo 26. Another feature of the walk was the road bridges over the canal of which the fifth would be my end point of the walk for the walk today. 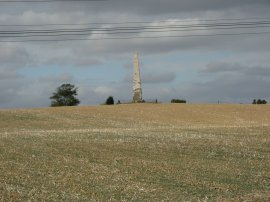 Having crossed over the first road I then passed below the Cosway memorial obelisk, photo 27, a monument that had been visible for much of the day when I was over the marshes, which was erected in memory of Sir William Cosway who lost his life in a coaching accident in 1834. 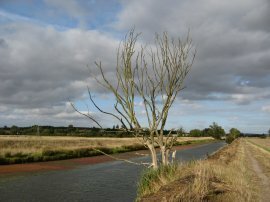 I continued on down the canal, photo 28, along a much narrower section of the path than previously to the second road where the path passes below the church of St Mary Magdalene at Ruckinge, photo 29. 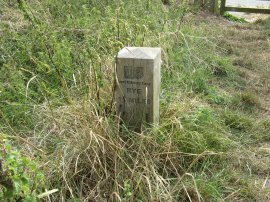 Every mile there is a small wooden post showing the distance to Rye on one side and Hythe on the other, the post nr Ruckinge being 11 miles from Rye, photo 30. 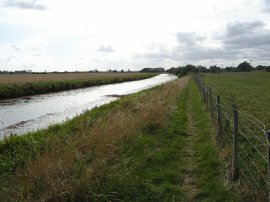 At Ruckinge the route moves to the left hand bank of the canal and heads along a rather boring farm track that runs besides the canal for most of the 1.6 miles to bridge three of the afternoon which is below Ham Street. 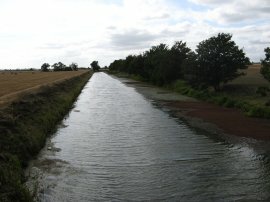 The canal was built with a number of kinks along its length, designed to enable the defenders to fire at anyone attempting to cross the canal and one of these kinks can be seen at the end of photo 31. From here it was only a short walk to cross back over the A2070 and then just over a further half a mile back to the Warehorne bridge, photo 33, where I finished this stage of the walk. It was then just a short walk up the road back to where I had parked the car. 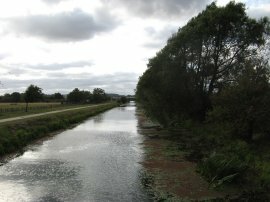 The total distance I walked on the day was 15.5 miles of which 4.8 were along the Royal Military Canal. It had been interesting wandering around the edge of Romney Marsh and the wide open fields lined with the drainage ditches have a certain appeal although I did get rather tired of the poor quality of the paths in the area and the marsh itself is an area I would probably not go out of my way to visit again.